Microsoft is using the power of achievement points to give people more reason to visit its Game Room. The lasting rewards for visiting an arcade in the past have usually been the knowledge of a day well spent and a thin layer of child's regurgitation on your shoes. Microsoft's upcoming Game Room, a new marketplace of sorts that is inspired by classic arcades and their games, can't replicate the experience of the latter, but it has been revealed that using Game Room to play games such as Centipede and Asteroids Deluxe could provide up to a full 1,000 achievement points. The points will be spread across 56 different achievements, though some of them are very simple extensions of others. 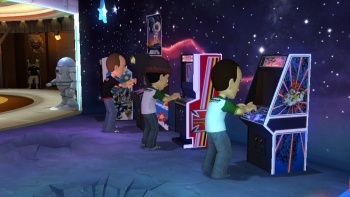 The achievements give clues to the functionality that Game Room will provide its users, such as the abilities to place themes, mascots, and decorations. In the Game Room announcement trailer, classic videogame creatures were shown wandering about people's arcades, so now we know these are Game Room's mascots. Other achievements are awarded for visiting friends' arcades, though Microsoft has said we won't be walking around them like in PlayStation Home, so it's unsure exactly how this feature would work. It could just mean to visit a friend and play against them. Achievement points are also doled out for winning challenges, spending a set amount of time playing games, winning medals, and "leveling up." How users will level up and what it will mean doesn't seem to have been revealed yet, but we'll find out for sure when Game Room is launched on March 24.